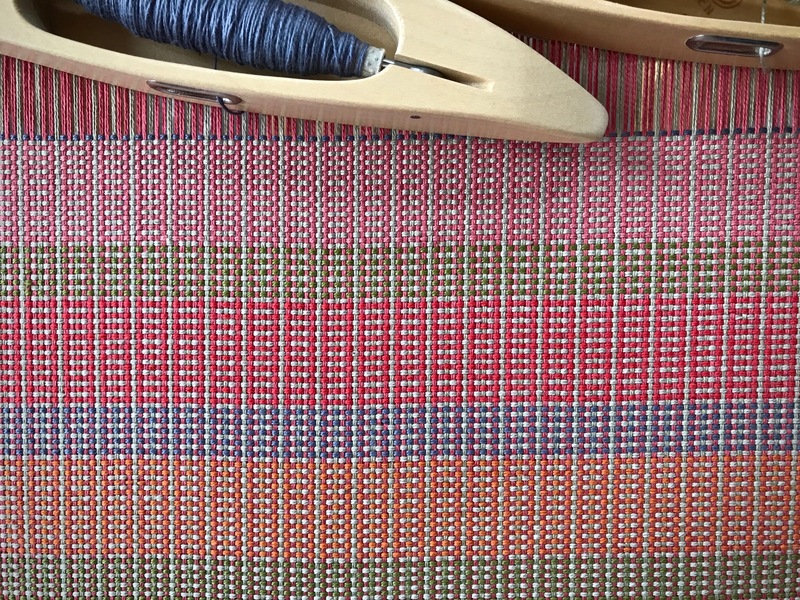 Remember the placemats I started on my Texas hill country loom in Colors on Trial? The pattern in the fabric looks nice and pretty. But it doesn’t display the striking color-and-weave effect that I expected. The problem is not the threading, nor the colors. Nice and pretty, but lacking the boldness of the planned color-and-weave effect. Aha! I overlooked an important detail on the treadling draft—the weft is supposed to be doubled. That changes everything! Since there is very little excess warp for this project I need to back up and start over. Backing up. 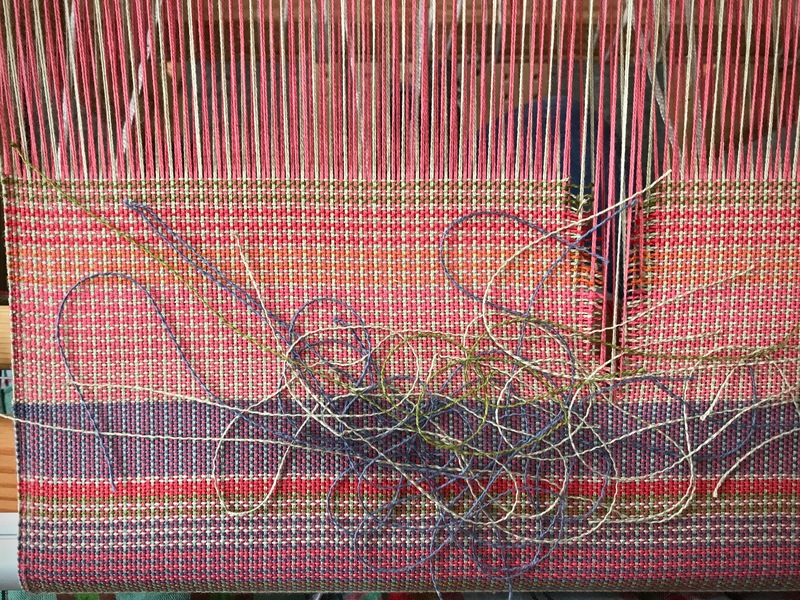 After loosening warp tension, I carefully clip the weft threads down the center of the warp. I go at a snail’s pace to avoid accidentally snipping any warp ends. Removal, one pick at a time. I press the treadles in reverse order to pull out each row of weft threads. Back to the start. Sufficient weft has been removed. Now I am ready to start over. I am losing the nice and pretty fabric. But it is being replaced with something better—fabric with a bold color-and-weave effect. This is the color-and-weave effect I was looking for! Two double-bobbin shuttles carry the weft threads. First placemat is a “Joseph’s coat” combination of colors. Bold color-and-weave effect has a striking pattern. I would like my life to be nice and pretty, easy and comfortable. But if I get closer to the Grand Weaver’s intentions, I see something different—a bold strength of purpose. Not necessarily easy. God’s will is better than mine. When we aim to understand his will, we see details that we’ve overlooked. It affects how we walk through life. We take his doubled weft threads to replace our well-meaning attempts. The result is a beautiful display of striking life-changing effects. May you be mindful of the important details. I love your analogy and courage to cut out all that work. It did look nice before but wow! Such a great difference with such a small change. An encouragement to make small changes in life as they may lead to great overall improvements. Have a great day, Karen! Hi Annie, Indeed, small changes can make a world of difference! Hi Karen, I used to work for your husband in Tulsa. Love your work. My cousin weaves and I have shared your blog with her, she sure enjoys. Hi Cynthia, It’s good to hear from you! So glad to have you and your cousin join us here! 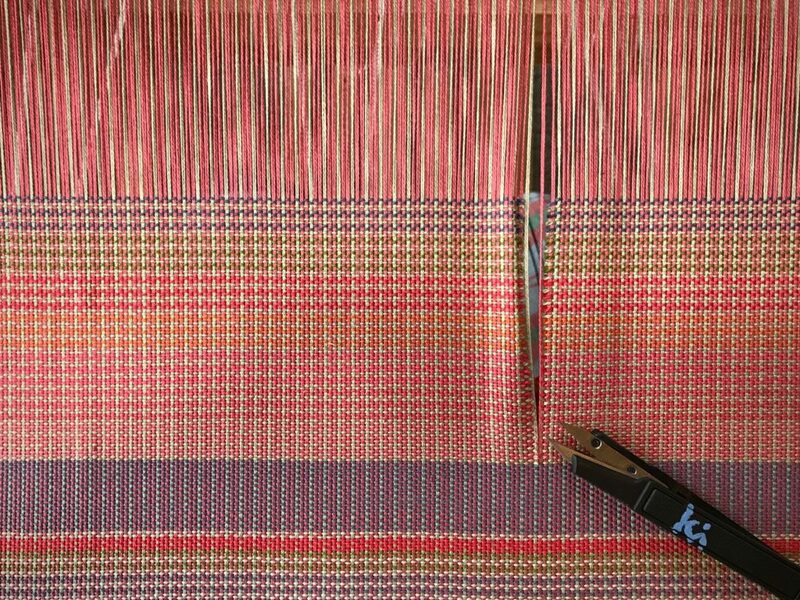 Hi Ruth, I do think removing the weft this way is less damaging to the warp. Even if I don’t clip through the center, I usually cut the weft and pull it out rather than send it back with the shuttle if it’s more than one or two picks. 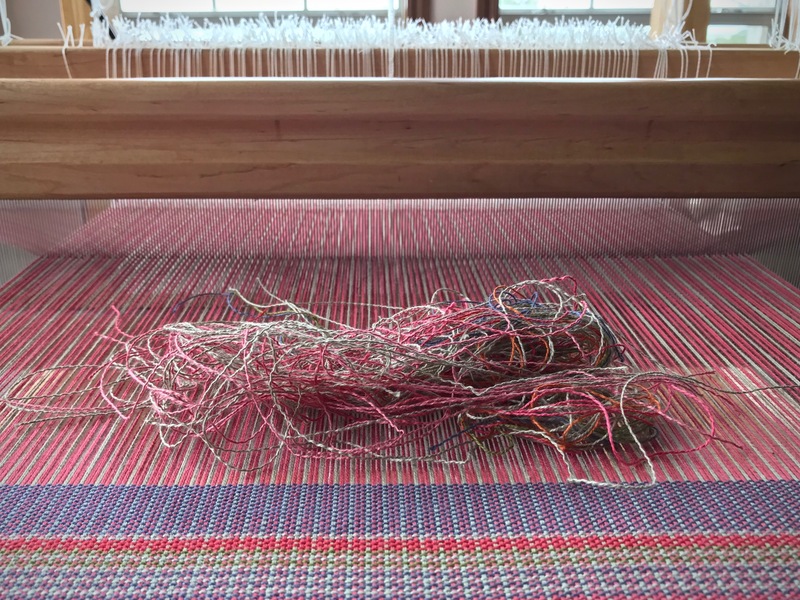 This is especially important if the warp is linen, which is much more susceptible to breakage from abrasion than this cotton warp I have here. 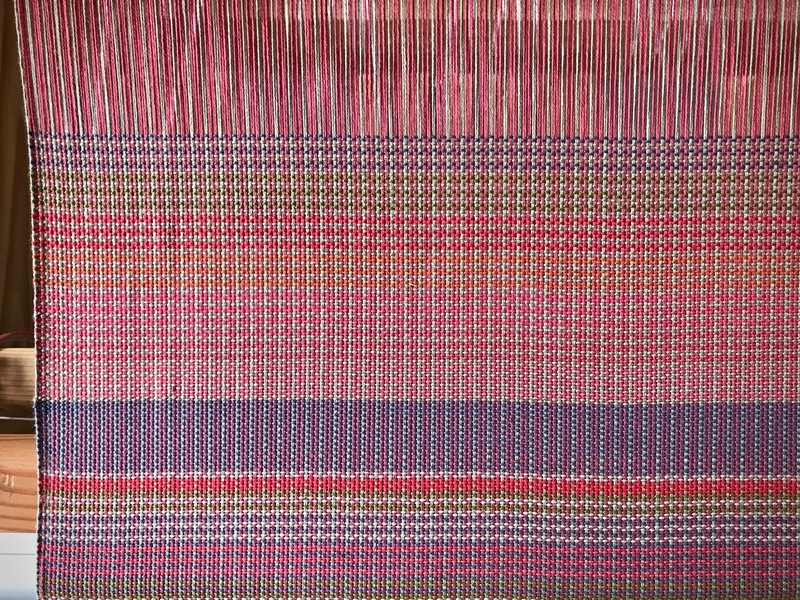 One thing I enjoy about weaving is that just about anything can be corrected! These are, as all your projects are, beautiful! Is this a little like doubleweave? You see the back on the front and the front on the back? Hi SM, I appreciate your sweet compliment! This is much simpler than double weave. 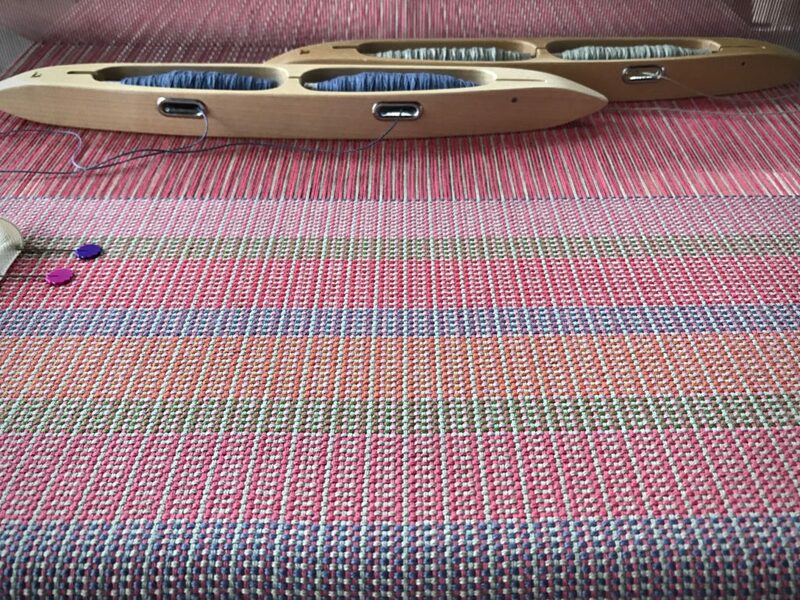 This is actually plain weave with two treadles. It’s the arrangement of stripes in warp and weft that give it visual complexity. This fabric is the same on front and back. It’s amazing what can happen with color and weave!